St. Johns Bridge (1929) linking N. Portland to the NW side of Portland. The Willamette R. flowing toward the Columbia River a short distance away near Linnton, Oregon. the Marquam Bridge (1966) stretches I-5 (North/South Bd.) across the Willamette River at the south end of Portland, Oregon. Note the old submarine moored at the Oregon Museum of Science & Industry (OMSI). I took this photo from the Tilikum Crossing Bridge (2015). 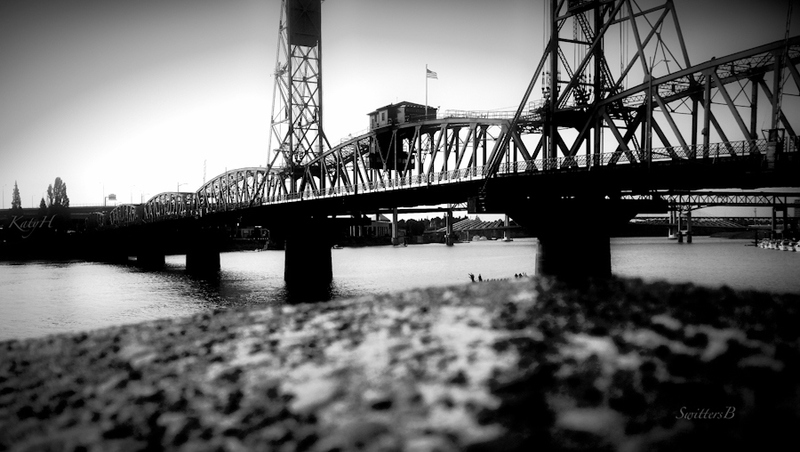 Twelve bridges span the Willamette River in the Portland Metro area. Along Portland’s waterfront on the west side of the Willamette River….sunshine would have been nice, but not too cold. I don’t usually take shots of busy landscapes. The clutter of man is usually avoided. Here I saw the St. John’s Bridge (Portland, Oregon) spanning the Willamette River. Perhaps that would be a shot without the intrusion of the pilings, structures and rope/buoy…but I took in anyway… just because. Photo taken from the abandoned Linnton Plywood Factory.